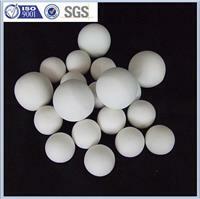 Alumina Grinding Balls are suitable for grinding medium used in ball grinding machines. The alumina balls’ wear-resistance is higher than the common alumina balls’. When it is working, the ball won’t pollute the grinding materials, so it can keep the purity and improve the stability of grinded materials especially the ceramic glaze. The high density, high hardness and the high grinding characters save the grinding time, enlarge the smashing room. So it can improve the grinding efficiency.